The home theater has become an important part of everyday life. It's where many hours are spent as family and friends come together for entertainment and relaxation. BDI home theater cabinets and TV stands merge innovative engineering and original design to seamlessly integrate today's technology, making the home theater feel more like home. 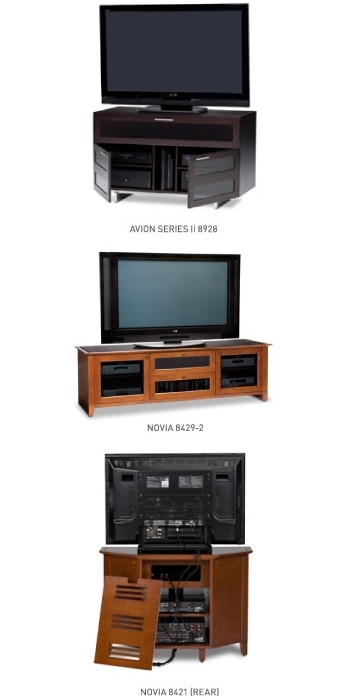 From the family room to the living room to the bedroom, there's a BDI solution for any setting. Units with this icon include a concealed compartment designed for use with a center channeled speaker. The compartment may be a drawer or a shelf that includes a speaker-fabric panel front, allowing the speaker's sound to come through. BDI's furniture features only the finest quality materials and finishes. Sturdy construction and steel or interlocking-panel supports provide a strong foundation for your home theater. Additionally, BDI specifies only the finest European-style hardware. Door handles and other metal details are beautifully finished. BDI home theater furniture is engineered to keep the usual tangle of cables and connections neatly under control. Cabinets feature removable back panels for easy access to the rear of components. Integrated routing channels provide space for speaker and TV cables to be neatly concealed. In order to perform at peak levels, components not only need to look cool, they have to stay cool. BDI cabinets facilitate airflow through generous ventilation slots integrated into the bottom panel, wood shelves and removable back panels. Cooler air is drawn in from the bottom of the cabinet, while hot air is naturally expelled out the back.